Visual Web links and mapping tool. Is there a better alternative to SiteOrbiter? Is SiteOrbiter really the best app in Servers category? Will SiteOrbiter work good on macOS 10.13.4? 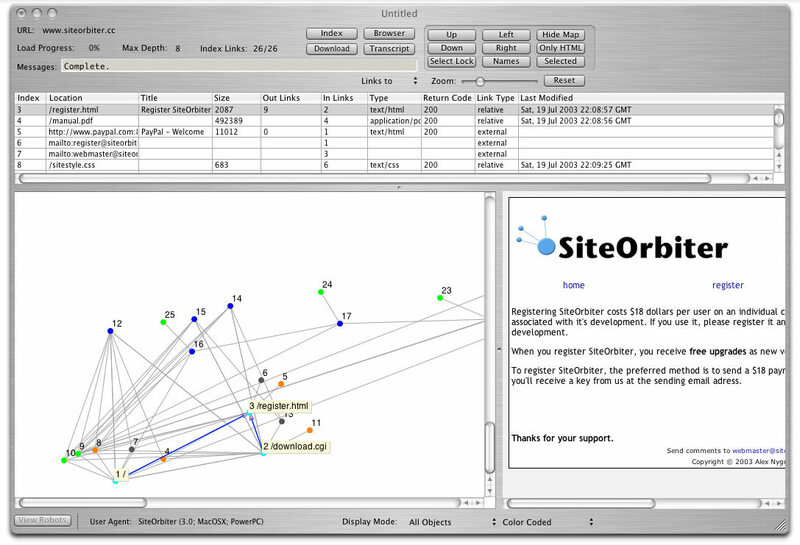 SiteOrbiter is a visual reporting tool for Web developers and administrators. It enables the user to graphically report on broken links, see link relationships in a visual map, and get a quick understanding of a websites complexity. Get familiar with a Web site quickly and easily. With the SiteOrbiter Web cartography tool, you can gain insight into the structural components of a site. Graphically report on broken or moved links to both local and remote Web addresses. Instantly understand a Web site's complexity and depth. SiteOrbiter needs a rating. Be the first to rate this app and get the discussion started! Search across the entire sight for particular page characteristics, such as number of inbound or outbound links, find all links to a particular page or type of page, or HTTP information. Track changes to a site over time. View HTTP headers for any page on the site. Export a comma-delimited spreadsheet of the site characteristics. Export a PDF map of the site for documentation. Scale the number of sites you can administer and manage. Download sites to the local disk. Build site reports on local or on remote sites.